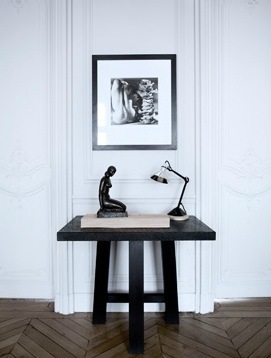 This interior by Gilles & Boissier is such an effortless mix of classic form with a modern material palate. Swoon! 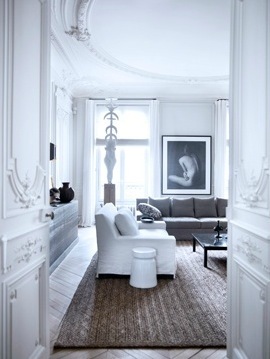 The moldings in this apartment are stunning not to mention the disappearing drapery panels and romans. I have to say that I am in love with this chunky natural abaca rug paired with these tailored white and grey slipcovers on this herringbone floor. It is absolutely perfect. 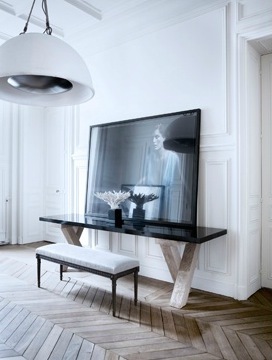 Christophe delcourt table? The composition here is just right. My fav, a banquette wrapped around the dining table. Ethereal. 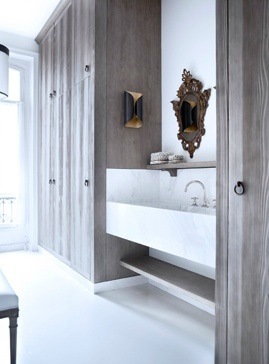 This sconce is amazing… love it all! When can I move in????? 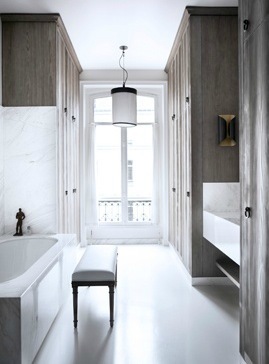 The wall and ceiling details, that floor…amazing. So gorgeous and relaxing with that scale and muted colors. I would love to come home to this! …and the b&w photographs! Top class interior design, Chantal! Chantal, these images make my heart beat faster. Absolutely chic! !